I have just finished up my first homemade sword display and I'd like to have commits and or suggestions for my next display project for my Rapiers and daggers. The display is made of oak and red lacquer. The hangers are just chrome pulls from Home Depot. very nice. I had actually thought about doing the same thing, but have not wanted to bolt anything to my apartment wall. I have been building sword and dagger racks all weekend. Any problem with traffic in the area? That's pretty cool Gary! If you had a scimitar or a sabre (or some kind of curved blade), you could display that above the framed picture to create a "halo" effect. You did a nice job with that! Perfectly spaced! While on the subject here are some cool invisible display hooks that I found on ebay. They basically scissor open and closed to fit around the blade. They wont' work on anything with a complex guard like a rapier or basket hilt but for most medieval swords they adjust to the blade width. I was thinking about that type of hanger, but I have children (nieces) over and I wanted to make sure they could not take a sword down and hurt themselves. The cabinet pulls does that without "Locking" them in and it makes for an easy way to still take them down and do cleaning. 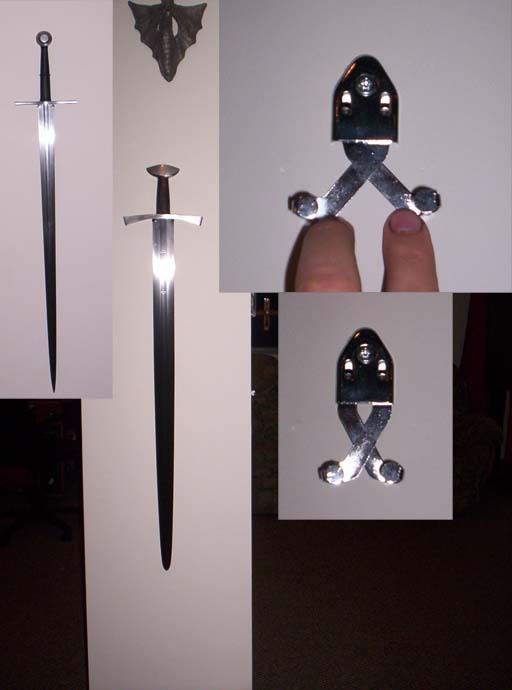 The rapiers will have to be mounted separately on a mount holding the blade rather than the basket in a horizontal position. I really like it! Much better than what I use. I have some of those cheap wooden racks that hold the swords horizontally (in addition to others that are individually hung on nails or pewter wall-hangers). Yours is quite attractive. I might consider something similar. Here is a better picture of the router work and rosettes. And a better shot with the Old and New Coustille's . The Old Coustille just came in Tuesday and I have made a comparison that I will post in another part of the forum. The way I want to redo it is as I did before, but with plexi/lexan/glass framed in the lower section. The screen behind is not part of the intended display. Just on the display side, so as not to box in the dust; leaving the back to the wall open air. This would keep little fingers out of it and off the swords. Very nice! You've got a lot of stuff there, how long have you been collecting. I've had a fair amount in the past, but moves and divorce in the past saw a lot of my collection disappear. Had a drug addicted brother n law take and sell most of my collection long ago in a very bitter breakup with the first wife.